In addition to the four preseason games in August and Sept 2016, the Seahawks will open the season at home against the Dolphins and have an early BYE in week 5. With THREE SNF games (pending flex schedule changes after week 5), a Monday Night Football game, a Thursday Night Football game, and a Saturday game, the season is full of those primetime opportunities to shine that our Hawks have come to cherish. Not to mention, only 2 early games - possibly a result of the Rams relocation, but also the least amount of 10:00am games I can remember us ever having. 12s, your travel opportunities come early with LA on Sept 18, and to sunny locations as the Seattle temps start to chill (New Orleans for Halloween? YES. Tampa Bay for Thanksgiving? WHY NOT?). For those who love the snow, try a trip to Green Bay in mid-December. NFC West Rivalry games bookend the season, with a Week 2 at LA, a Week 3 matchup here at home vs. the sad 9ers on Sept 25 and Oct 23 in Arizona, then an exciting 3-week stretch with a Thursday night game at home against the LA Rams, Saturday Christmas Eve game against Arizona at the Clink and New Years Day at San Francisco. What games are you most looking forward to at home or on the road? Its a new day and I can't hear too well, can't talk too well and I've definitely lost a spectrum of my voice, maybe for the week, maybe forever. More importantly, today I just can't shake the feeling of a significant new moment as a #12. If you've been a 12 for more than, say, 7-10 years, you know the feeling too - something akin to the 'underdog' fighting and clawing to the top and gaining their due. It started at the end of our playoff game in Atlanta last year and it has been building, rolling, and expanding to fill the room and, last night, the entire state. For the first time in my lifelong career as a 12, I had essentially no playoff anxiety this week. Tailgating was all about biding time to kick-off. Halftime was just a moment to give our voices a rest. For a span of the final drive of the game, I wasn't freaking out - mostly because this team has trained me to "3elieve". We GOT This. So then the final interception. ELATION, of COURSE. But not in the same way of 2005's games. Not even the same as the January 22, 2006 NFC Championship - the one where we pretty much knew by the 4th quarter and I still ended up crying with joy when the confetti flew and Hass HOISTED that George Hallas trophy. No tears last night, because it was just plain RIGHT. DESERVED. NATURAL. 'OBVI'. Because this particular group of 53 deserved a Super Bowl from the moment they came together in what was hashtagged a 'Championship Offseason'. Because this is the power of 1-0, I'm In, The Separation is in the Preparation, and #GoHawks. (And that's how you build a fanbase like the 12th man: from the beginning and with shared values, through and through). 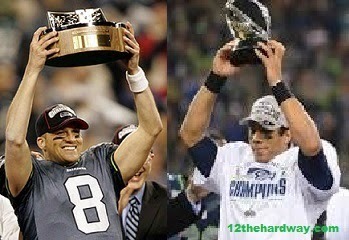 And above all, Because 12s KNOW what this team is and why we're the underdogs and that THIS is our moment. THIS is our Year. So welcome to the brave new world, 12s. It might not be the Hardway we're used to, but it wouldn't be as sweet without all we've seen before. Welcome to your ultimate day, dear #12s. December 12, 2012 is all about YOU. I'm going to share a little story with you all and I don't even know if there is a point before I begin, but it is fairly poignant. I hope. Traditionally, I celebrate 12-12 by doing some kind of volunteer service in honor of my Grandma Jane, who passed away in 2000. She would have loved that last Seahawks game, even though she wasn't toooo happy the time I told her, "I do go to church on Sundays, it's the church of the NFL". You all would have loved her, because she was smart and hardy and devoted, like you, #12. 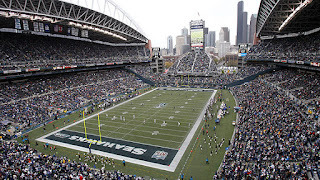 IMAGINE my amazement when I showed up to our first home game at Seahawks Stadium only to find Mt. Kilimanjaro looming large over the North End Zone late this past summer. Tell me the chances of the people who run tourism advertising for Tanzania selecting Seattle as their target market for an enormous, season-long campaign? Tell me more about how amazing of a year we could have with a rookie QB. 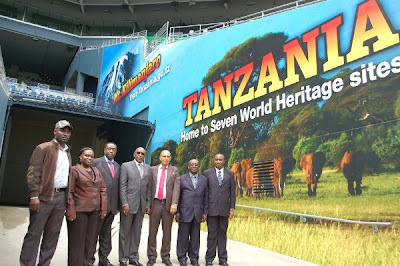 And how "TANZANIA!" would become a battlecry on Twitter. It became really crystal clear to me that my 12-12-12 couldn't be spent in Africa, because it was important to be HERE, in Seattle, in December. Looking at the calendar, how do you fit in a once-in-a-lifetime trip to Africa between the Cardinals and 49ers games? You don't. 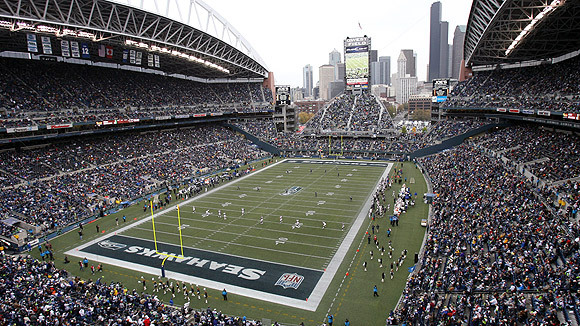 And YES, it sure is cheaper to stay home, even if Seahawks ticket prices are cray. I will get to Africa one day. I will take a 12th Man Flag to Mt. Kilimanjaro via TANZANIA. I will continue to volunteer in our community and wherever I am able. And I will celebrate 12-12-12 Day with my family and fellow #12s, because that's how I roll. Tonight I spent a blissful hour an a half in the crisp Seattle dusk standing on concrete (in heels) waiting for Golden Tate to sign my ticket from September 24th's MNF win over Green Bay. I was #240 something in a long, long line of #12s. We knew the chances of Mr. Tate staying past the 7pm cutoff in order to sign our belongings was slim, and yet no one left the line until Golden left the building. At one point I thought to myself, "who are all these people crazy enough to stand in the cold just to see Golden Tate?" And then I realized they were all like me. (duh). 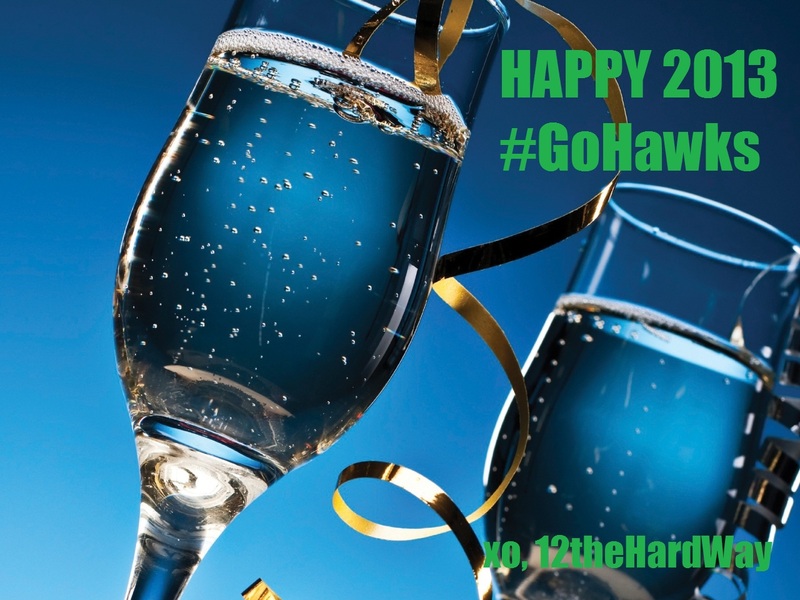 Like true #12s, we remained optimistic throughout the wait, and even upbeat when it was declared we were S.O.L. All was not lost, though. 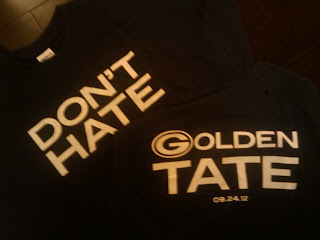 I picked up 2 amazing T-shirts from a couple of enterprising young men selling them out of a suitcase...the front reads "Don't Hate" and back reads "Golden Tate," complete with the GB "G" and the date of the infamous MNF romp. (YAH, I said ROMP...EIGHT SACKS.) Also had an awesome conversation with a fellow #12 in line. P.S> the 2 guys selling these shirts will also be out at the game on Sunday. How cool would it be to have Showtime himself sign this T? Yes. As Seahawk fans, we see heroes come and go probably more than we like to admit. But this weekend we lost a major 12th Man and a true American hero. George Hickman Jr. was a WWII Tuskegee Airman and a part of the Seahawks family. We can all be proud to have spent Sundays in the same stadium. Thank you, George Hickman Jr.
How many days until the home opener vs. the Dolphins? How Blue is Your Blood?